The inaugural convention of 'Thulya Prathinidhya Prasthanam' will be held in Thrissur on Wednesday. People of Kerala wouldn’t have forgotten the long speeches and statements on equal rights and representation of women which many leaders of major political parties had made following the controversy over entry of young women into Sabarimala. But now, a few months later, in the wake of Lok Sabha polls, the candidate list of these parties has shown us exactly where they stand in the matter of equal representation of women. Realising that a consistent fight is required to ensure equal representation, a group of women in Kerala have come forward to form Thulya Prathinidhya Prasthanam, a collective which will work towards this goal. 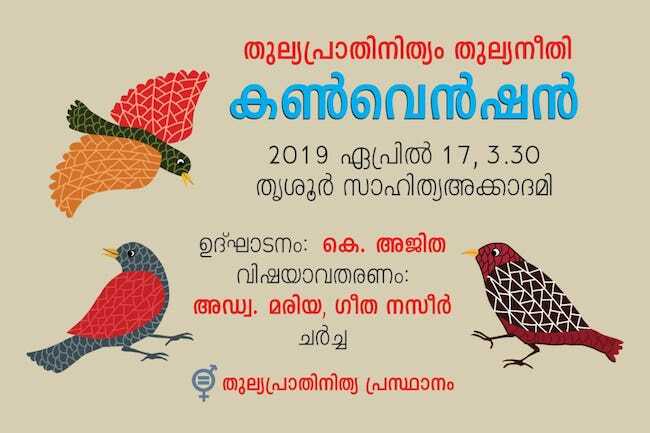 Thulya Prathinidhya Prasthanam will have its inaugural convention at Sahitya Akademi hall in Thrissur on Wednesday. KM Rema, one of the conveners of Thulya Prathinidhya Prasthanam, tells TNM about the need for forming such a collective. “During the past few months, Kerala witnessed deep discussions on women’s rights and representation. Vanitha Mathil or women’s wall and progressive stand of many leaders has given us hope. But as usual, when matters regarding positions of power came, women were sidelined by all political parties,” Rema says. Out of the 20 Lok Sabha seats, the major political coalitions of Kerala, Congress-led United Democratic Front (UDF), CPI(M)-led Left Democratic Front (LDF) and BJP-led National Democratic Alliance (NDA), have given not more than two seats for women in the upcoming polls. “The candidate list of these parties has left women in the state disappointed as that was not what was expected,” says Rema. “Women’s Reservation Bill which gives 33% reservation for women in Parliament and state assemblies has been pending for the past 23 years. By now, it has become clear that the bill is not going to get passed naturally without any coercion from people. Though many had voiced for it in the past, there has been no consistent movement which could mount pressure for equal representation. We are here for that,” tells Hema Joseph, another convener of the collective. Both Congress and BJP have highlighted Women’s Reservation Bill in the 2019 Lok Sabha election manifestos. It may be noted that BJP had in the past Lok Sabha election manifesto, said that they were committed to pass the bill, but the same was forgotten when the party came to power. The members of the collective expect the participation of women from all walks of life, including those from the cultural sphere and even political parties. “We personally know a lot many women political leaders who have been sidelined by the men in their parties. Though they have not openly declared this to the media, this is a fact. During the course of the collective’s work, we believe they will also join us,” says Rema.